Helping to kick off Thanksgiving week, young members of a Valley Center for the Blind training program served up lunch Sunday to the homeless. The youth, ages 16 to 24, are participating in an empowerment and skills development program through Valley Center for the Blind, a nonprofit organization that provides programs and services for people experiencing vision loss in the Central Valley. Director of operations Shellena Heber talks about how important helping out the community, especially those in need, is for the young people facing their own challenges. Thursday’s Latin Grammy Awards were a love letter to Puerto Rico, with several artists dedicating their performances and awards to the island hard hit by Hurricane Maria. Lin-Manuel Miranda, rapper Residente and singer-songwriter Luis Fonsi, all of Puerto Rican heritage, dedicated their awards to their homeland. Fonsi’s global hit “Despacito” was the night’s big winner, making good on all four of its nominations, including record and song of the year. The ceremony, held at the MGM Grand Garden Arena and broadcast live on Univision, opened with a moment of silence for Puerto Rico, followed by a performance by one of its native sons. Residente wore a T-shirt emblazoned with the Puerto Rican flag he performed his song “Hijos del Canaveral” (“Sons of Canaveral”), a tribute to his country. He also won two awards: urban album for his self-titled solo debut and urban song for “Somos Anormales” (“We Are Abnormal”). Ruben Blades won the top prize, album of the year, for “Salsa Big Band.” Other winners included Shakira, for contemporary pop album, Juanes, for pop-rock album, and Vicente Garcia, who was named best new artist. Most of the night’s awards were presented during a pre-telecast ceremony, while the live broadcast was dominated by performances, including Natalia Lafourcade, Maluma, Juanes, J Balvin, Lila Downs, CNCO, Mon Laferte, Nicky Jam and Carlos Vives. Besides Puerto Rico, the Latin Grammys also had a political element. Multiple nominee Danay Suarez spoke about sexual harassment. Presenter Wilmer Valderrama urged viewers to “make history in the next three years.” Other artists noted that music has no borders and no walls. Alejandro Sanz, who received a special award, used his time onstage to call attention to the “dreamers” affected by President Donald Trump’s suspension of the Deferred Action for Childhood Arrivals program. Sanz said backstage he was incredulous that such a decision could be made “in this century, in this country” with apparent disregard for the people it would impact. Natalia Lafourcade poses in the press room with awards for best folk album for “Musas Un Homenaje Al Folclore Latinoamericano En Manos De Los Macorinos, Vol. 1)” and best long form music video for “Musas, El Documental” at the 18th annual Latin Grammy Awards at the MGM Grand Garden Arena on Thursday, Nov. 16, 2017, in Las Vegas. Iranian President Hassan Rouhani is promising to rebuild the country’s earthquake-devastated area in the “shortest” timespan possible. Rouhani, who was visiting the area Tuesday, said his administration plans to support reconstruction with both handouts and loans. He says he appreciates foreign countries for expressing sympathy with victims of Sunday’s temblor, which measured magnitude 7.3. The quake killed hundreds and injured thousands in the border region of Iran and Iraq. Authorities say the quake destroyed more than 12,000 homes and local reports say many people are still in need of tents and blankets. Iran sits on many major fault lines and is prone to near-daily quakes. In 2003, a magnitude 6.6 earthquake flattened the historic city of Bam, killing 26,000 people. In 2012, a major casualty earthquake killed over 300. Rescuers are digging through the debris of buildings felled by an earthquake that killed more than 430 people in the border region of Iran and Iraq. The work is taking place two days after a magnitude-7.3 earthquake struck Sunday night Iran time, just as people were going to bed. The worst damage appeared to be in the Kurdish town of Sarpol-e-Zahab in the western Iranian province of Kermanshah, which sits in the Zagros Mountains that divide the two countries. Residents fled without time to grab their possessions as apartment complexes collapsed into rubble. Outside walls of some buildings were sheared off, power and water lines were severed, and telephone service was disrupted. Residents on Monday dug frantically through wrecked buildings for survivors. President Donald Trump is known for his long, at times aggressive, handshakes with world leaders. But at an international summit in the Philippines on Monday, he struggled briefly with a different kind of handshake. Trump, in Manila, attended the opening ceremonies of the Association for Southeast Asian Nations conference, which began with pageantry and a group photo of the leaders. Then, the announcer intoned that it was time for the leaders to take part in the “traditional” ASEAN handshake. It’s a cross-body exercise, during which each leader extends their right arm over their left and shakes the opposite hands of those next to him. The announcer’s instructions briefly baffled Trump, who at first simply crossed his hands in front of him. Then, looking around, he turned to the leaders that flanked him — Vietnamese Prime Minister Nguyen Xuan Phuc to his right, Philippine President Rodrigo Duterte to his left — and simply extended his arms outward, only to find that wasn’t quite right either. Then he laughed, crossed his arms and reached to the correct sides. He grimaced at first, particularly when bending down to reach the hands of the two shorter leaders next to him. And then, with an exaggerated smile, he vigorously gripped their hands. Handshakes have become a Trump trademark in his first year in office. He often pulls the other person toward him and pats or yanks in a sign meant to set a tone for the meeting ahead. He pulled Japan Prime Minister Shinzo Abe’s hand toward him and then held onto it for a long time, prompting an eye roll from Abe as Trump looked away. Trump and French President Emmanuel Macron engaged in a white-knuckle handshake. And Canadian Prime Minister Justin Trudeau, meanwhile, short-circuited Trump’s attempt at dominance, using his left arm to hold onto to Trump to prevent being pulled toward him. This photo gallery highlights some of the top news images, made by Associated Press photographers in Latin America and the Caribbean, published in the past week. People visited cemeteries across Latin America on the Day of the Dead to visit with loved ones who passed away. Mexico has particularly exuberant celebrations, with parades and costume events at which many people dress up as skeletal Catrinas. Looking ahead to next year’s presidential election in Mexico, the National Liberation Zapatista Army presented its candidate, Maria de Jesus Patricio, a member of the Nahua indigenous group. Supporters are staging an uphill battle to sign up the 866,000 voters needed by Feb. 12 to get her on the ballot as an independent candidate. Mercedes driver Lewis Hamilton of Britain celebrated his fourth career Formula One season championship at the Mexico Grand Prix held at the Hermanos Rodriguez racetrack in Mexico City. Venezuelans continue to struggle amid their country’s severe economic slump and divisive political confrontations, but people still found time for daily lives, from dancing salsa at a club to performing in the street. There was plenty of soccer for the region’s fans. Lucas Albertengo of Argentina’s Independiente fought for the ball with Rodrigo Rojo of Paraguay’s Nacional during a Copa Sudamericana match. This photo gallery was curated by photo editor Tomas Stargardter in Mexico City..
For five decades, Ana Carrion has donned a purple robe and joined hundreds of thousands of people who pour into Lima’s streets in late October to venerate a 17th century rendering of Jesus Christ. It’s called the Lord of Miracles and is credited with everything from curing illness to protecting this coastal city from earthquakes. “I feel an energy that relieves me of all my pain,” said Carrion, a 59-year-old architect who believes her faith in the religious icon is what has seen her through four heart surgeries. The image’s trek through the city over five days is one of the largest processions in the Roman Catholic world, attracting more than 100,000 people and culminating every Nov. 1 when a giant replica is carried to Las Nazarenas monastery in downtown Lima where the original mural is. Celebrations are also held in every corner of this Andean country as well as far away as Italy and Japan as part of the fast-growing Peruvian diaspora’s ways to reconnect with its roots. The image of a darker-skinned Jesus on the cross is believed to have been painted by an Angolan-born slave. After a devastating earthquake in 1655, the wall with the mural was one of the few parts of the church still intact. Deeming this a miracle, people gave the image an additional name — “The Christ of Earthquakes” — and almost ever since have paid homage to it in citywide processions. The procession of the replica, which is hoisted on a 1-ton wooden platform carried by a constantly recycling group of 30 male worshippers, draws huge, traffic-snarling crowds the likes of which Peru rarely sees. In this staunchly Catholic nation, it’s also an obligatory touchstone for self-respecting politicians and celebrities who pose for photos with devotees. But beyond the very public street festival there are also more intimate moments, like when the painting stops at several public hospitals and is greeted by dozens of sick patients and women about to give birth. “It cures all of your illnesses, all of your suffering, and takes away all of the sins that fester inside you,” said Carrion. With solemn faces and outright tears, Thais said farewell to their king and father figure with elaborate funeral ceremonies that cap a year of mourning and are steeped in centuries of tradition. Smoke rose just before midnight Thursday from the spectacularly ornate crematorium built in the year since King Bhumibol Adulyadej died. On Friday morning, his son, current King Maha Vajiralongkorn, participated in a religious ceremony to move his father’s ashes to special locations for further Buddhist rites. The five-day funeral rites began Wednesday with Vajiralongkorn performing Buddhist merit-making rites and on Thursday, a ceremonial urn representing Bhumibol’s remains were transferred from the Dusit Maha Prasad Throne Hall to the crematorium in somber processions involving thousands of troops, a golden palanquin, a gilded chariot and a royal gun carriage. The urn, placed under a nine-tiered white umbrella and accompanied by a palace official, was hoisted into the main chamber of the golden-spired crematorium as monks chanted, traditional instruments wailed and artillery fired in the distance. The king then climbed the red-carpeted steps to light candles and incense in honor of his father. On a day designated a public holiday in the kingdom, tens of thousands of mourners dressed all in black watched the processions from streets in Bangkok’s royal quarter and millions more watched broadcasts aired live on most TV stations and shown at designated viewing areas across the country. Before dawn, 63-year-old Somnuk Yonsam-Ar sat on a paper mat in a crowd opposite the Grand Palace. Her granddaughter slept in her lap and her husband rested his head against a metal barrier. The family came from the coastal province of Rayong, where they run a food stall. Somnak waved a fan to cool herself but said she was not tired. Bhumibol’s death at age 88 on Oct. 13, 2016, after a reign of seven decades sparked a national outpouring of grief. Millions of Thais visited the throne hall at the Grand Palace to pay respects. Deceased Thai royals have traditionally been kept upright in urns during official mourning. But Bhumibol, who spent much of his early life in the West, opted to be put in a coffin, with the royal urn placed next to it for devotional purposes. The ceremonial urn was at the center of Thursday’s processions, including one led by the current king when the golden container was placed upon the Great Victory Chariot. Built in 1795 and made of gilded and lacquered carved wood, the chariot has been used to carry the urns of royal family members dating to the start of the Chakri dynasty. As the chariot, pulled by hundreds of men in traditional red uniforms, passed the mourners lining the parade route, they prostrated themselves, pressing their folded hands and head on the ground in a show of reverence. In the evening, a symbolic cremation was witnessed by royalty and high-ranking officials from 42 countries. Orange-robed monks chanted Buddhist prayers to bless Bhumibol’s spirit as the official guests waited to walk into the crematorium to make offerings of flowers made from sandalwood. TV stations broadcast classical masked dances and traditional puppet shows as the country awaited word that the cremation had taken place inside the edifice built to represent mystical Mount Meru, where Buddhist and Hindu gods are believed to dwell. Further rites the began Friday morning involved removing Bhumibol’s ashes and relics to be transferred to the Grand Palace and the Temple of The Emerald Buddha for further Buddhist rites. They are set to be enshrined in spiritually significant locations on the last day of the funeral. The funeral is by design an intensely somber event, but also rich in history and cultural and spiritual tradition. 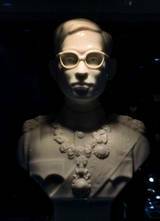 The adulation Bhumibol inspired was fostered by palace courtiers who worked to rebuild the prestige of a monarchy that lost its mystique and power when a 1932 coup ended centuries of absolute rule by Thai kings. That effort built a semi-divine aura around Bhumibol, who was protected from criticism by a draconian law that mandates prison of up to 15 years for insulting senior royals. But he was also genuinely respected for his development projects, personal modesty and as a symbol of stability in a nation frequently rocked by political turmoil, though his influence waned in his final years. Boonjerd Buasawat, a 61-year-old fruit vendor from the resort island of Phuket, waited near the cremation site since midday Wednesday and slept there overnight. Thais have braved tropical heat and torrential monsoon rains to secure street-side vantage points to witness the funeral. Thousands of police and volunteers were on hand to ensure order and entry into the historic royal quarter was tightly controlled to eliminate the faint possibility of protest against the monarchy or military government. An activist was detained earlier this week after writing on Facebook that he planned to wear red clothing on the day of Bhumibol’s cremation, a color associated with support for elected governments ousted in coups in 2006 and 2014. Thailand’s King Bhumibol Adulyadej watched over his kingdom for 70 years — and he continues to do so a year after his death. As Thailand prepares for his cremation ceremony Thursday, Bhumibol’s image is omnipresent across the country in messages commemorating his life and mourning his death. Photos of a monarch many Thais loved like a father can be found everywhere from billboards to ATM screens, from full-page tributes in national newspapers to commemorative books in street-side markets, from shrines in shopping malls to exhibits in art galleries. Up for grabs Sunday are 465 seats in the more powerful lower house, which chooses the prime minister. Abe dissolved the chamber less than a month ago, apparently judging that the political environment turned in his favor. Media polls have indicated voters see Abe’s government, despite recent scandals including his own, as a safer choice over an opposition with uncertain track records. Scare over North Korea’s missile and nuclear development is also seen prompting their conservative choice. An election victory would boost Abe’s chances for another three-year term as head of his Liberal Democratic Party next September, extending his premiership. With the winds dying down, fire officials said Sunday they have apparently “turned a corner” against the wildfires that have devastated California wine country and other parts of the state over the past week, and thousands of people got the all-clear to return home. While the danger from the deadliest, most destructive cluster of blazes in California history was far from over, the smoky skies started to clear in some places. “A week ago this started as a nightmare, and the day we dreamed of has arrived,” Napa County Supervisor Belia Ramos said. People were being allowed to go back home in areas no longer in harm’s way, and the number of those under evacuation orders was down to 75,000 from nearly 100,000 the day before. Fire crews were able to gain ground because the winds that had fanned the flames did not kick up overnight as much as feared. The blazes were blamed for at least 40 deaths and destroyed some 5,700 homes and other structures. The death toll could climb as searchers dig through the ruins for people listed as missing. Hundreds were unaccounted for, though authorities said many of them are probably safe but haven’t let anyone know. In hard-hit Sonoma County, Sheriff Rob Giordano said authorities have located 1,560 of the more than 1,700 once listed as missing. Many of those names were put on the list after people called from out of state to say they couldn’t reach a friend or relative. Many evacuees grew increasingly impatient to go home — or at least find out whether their homes were spared. Others were reluctant to go back or to look for another place to live. Juan Hernandez, who escaped with his family from his apartment Oct. 9 before it burned down, still had his car packed and ready to go in case the fires flared up again and threatened his sister’s house, where they have been staying in Santa Rosa. Evacuation orders were lifted for the city of Calistoga, the Napa Valley city of 5,000 known for its mud baths, mineral spas and wine tastings. The city was cleared out Wednesday as winds shifted, but homes and businesses were spared. At the Sonoma fairgrounds, evacuees watched the San Francisco 49ers play the Redskins on television, received treatment from a chiropractor and got free haircuts. Michael Estrada, who owns a barber shop in neighboring Marin County but grew up in one of the Santa Rosa neighborhoods hit hard by the blazes, brought his combs, clippers and scissors and displayed his barbering license in case anyone doubted his credentials. Lois Krier, 86, said it was hard to sleep on a cot in the shelter with people snoring and dogs barking through the night. She and her husband, William Krier, 89, were anxious to get home, but after being evacuated for a second time in a week Saturday, they didn’t want to risk having to leave again. Nearly 11,000 firefighters were still battling 15 fires burning across a 100-mile swath of the state. In the wooded mountains east of Santa Rosa, where a mandatory evacuation remained in place, a large plume of white smoke rose high in the sky as firefighters tried to prevent the fire from burning into a retirement community and advancing onto the floor of Sonoma Valley, known for its wineries. Houses that had benefited from repeated helicopter water drops were still standing as smoke blew across surrounding ridges. A deer crossed the highway from a burned-out area and wandered into a vineyard not reached by the flames. Those who were allowed back into gutted neighborhoods returned to assess the damage and, perhaps, see if anything was salvageable. Jack Daniels had recently completed a year-long remodel of his Napa house near the Silverado Country Club and watched it go up in flames last week as he, his wife, 7-year-old grandson and two pugs backed out of the driveway. His neighbors, Charles Rippey, 100, and his wife, Sara, 98, were the oldest victims identified so far in the wildfires. Daniels, 74, a wine importer and exporter, said he lost everything left behind, including his wife’s jewelry and 3,000 bottles of wine in his cellar. Melley reported from San Francisco. Associated Press writers Ellen Knickmeyer in Santa Rosa and Janie Har and Daisy Nguyen in San Francisco contributed to this report.